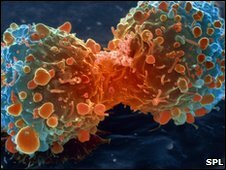 A gene that could help explain why some non-smokers develop lung cancer has been pinpointed by US researchers. It is hoped that further research into the GPC5 gene could open the way for new targeted treatments as well as picking out those at high risk. But Cancer Research UK said more work was needed to work out the exact reason for the link. A quarter of lung cancers globally occur in people who have never smoked, The Lancet Oncology reports. In the UK, 10% of lung cancers develop in people who do not smoke. The researchers said lung cancer in non-smokers was an increasing problem but the causes were not well understood. DNA samples from 754 people who had smoked fewer than 100 cigarettes in their lifetime were scanned to find the genetic differences that seemed most likely to affect the risk of lung cancer. When chronic respiratory disease, exposure to second-hand smoke and family history of lung cancer were taken into account, two sections of the genome seemed to be key. The team then took the 44 most common genetic alterations seen in the first part of the study and studied them in two other groups of non-smokers - half of whom had been diagnosed with lung cancer. The same two genetic marks were significant. A third study of 530 patients confirmed the result. Closer analysis showed that these two bits of the genome were responsible for switching on and off the GPC5 gene. Further tests showed that activity of the GPC5 gene was 50% lower in adenocarcinoma - the most common form of lung cancer - than in normal lung tissue. The researchers believe that this lower activity of the gene could contribute to the development of cancer in people who do not smoke. In a comment piece published alongside the study, Dr Ramaswamy Govindan, from Washington University School of Medicine, said "it is far from clear" how the finding could predispose people to lung cancer. Dr Kat Arney, Cancer Research UK's science information manager, said: "Smoking causes 90% of lung cancers, but there is still a significant number of non-smokers who develop the disease. "These new results could help to explain why, but much more work needs to be done to understand exactly how these gene variations are linked to lung cancer risk."